Dehydration can be as much of a problem in winter as it is in the summer. 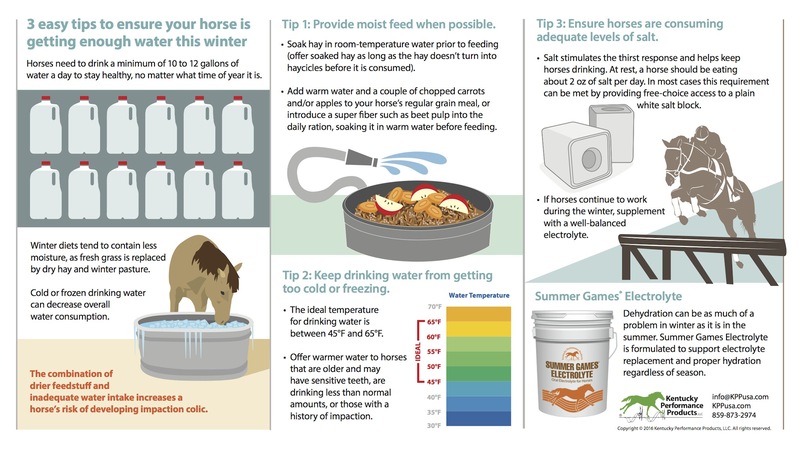 Horses need to drink a minimum of 10 to 12 gallons of water a day to stay healthy, no matter what time of year it is. Their requirements increase if they are ridden. 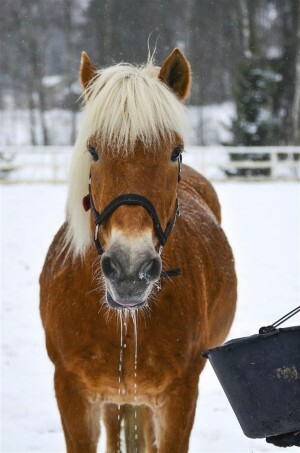 Horses that work in the winter continue to sweat, although it may not be as apparent because sweat evaporates quicker in the dry winter air. Many riders stop using electrolytes when cold weather sets in, thus lowering the salt levels in the diet and reducing the thirst response. Additionally, cold or frozen drinking water can decrease overall water consumption. Winter diets tend to contain less moisture, as fresh grass is replaced by dry hay and winter pasture is composed of dormant plant material that contains low moisture levels. The combination of drier feedstuff and inadequate water intake increases a horse’s risk of developing impaction colic. Tip 1: Provide moist feed when possible. • Soak hay in room-temperature water prior to feeding (offer soaked hay as long as the hay doesn’t turn into haycicles before it is consumed). • Add warm water and a couple of chopped carrots and/or apples to your horse’s regular grain meal, or introduce a super fiber such as beet pulp into the daily ration, soaking it in warm water before feeding. • Resist the temptation to feed the occasional wheat bran mash as it causes more harm than good. Tip 2: Keep drinking water from getting too cold or freezing. • Offer warmer water to horses that are older and may have sensitive teeth, are drinking less than normal amounts, or those with a history of impaction. Tip 3: Ensure horses are consuming adequate levels of salt. • Salt stimulates the thirst response and helps keep horses drinking. At rest, a horse should be eating about 2 oz of salt per day. In most cases this requirement can be met by providing free-choice access to a plain white salt block. • If horses continue to work during the winter, supplement with a well-balanced electrolyte such as Summer Games® Electrolyte to ensure proper hydration and electrolyte replacement. Click here to download this handy infographic for your feed room. Copyright (C) 2016 Kentucky Performance Products, LLC. All rights reserved. Where Does Your Jumping Horse Hurt? An Ulcer Management Alternative to Omeprazole?